Gamers looking for the right wireless mouse are in a tricky spot. You want the same latency you’ll get with a wired mouse, a sensor that’s at least passable for gaming, and a battery life that won’t leave you recharging in the middle of your match. Until quite recently, overcoming all of those hurdles meant good wireless mice for gaming were almost unavoidably expensive. But high-end wireless features are getting cheap. And wireless latency has improved to the point that wireless mice are almost indistinguishable from their wired counterparts. There may never have been a better time to go wireless, even for gamers who demand higher levels of responsiveness and precision from their mice. But there are still plenty of slow wireless mice on the market, so as usual, you need to know more about what you’re getting into. The Logitech G305 is a mid-range wireless mouse. It’s not quite as fully-loaded and customizable as you’ll see in the $150 price range, but it has all the essential features of Logitech’s flagship products. That’s why the G305 holds up favorably when compared to some of the most expensive mice on the market. It sacrifices essentially nothing in the way of quality and performance, and is a pretty transparent case of getting exactly what you pay for. With only a quick look at the G305, you could easily mistake it for a number of different Logitech mice. It’s almost a clone of their G Pro, which was a wired mouse built for the ergonomics of esports. The G305 has an identical chassis, making it an excellently comfortable mouse. 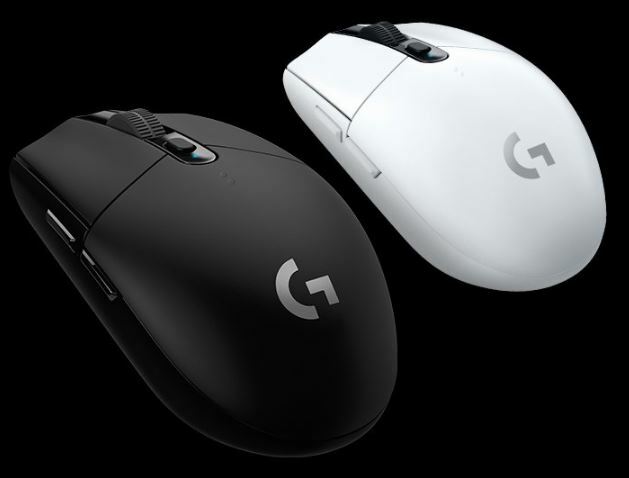 But the G305 is about 25% lighter than the Pro. If you prefer a weightier mouse, you’ll find no ability to add extra weight. That’s a feature you’ll see locked away on Logitech’s most expensive wireless mouse, the G903. But if you don’t have a preference for heavier mice, the G305 feels great. In spite of being somewhat lighter than the G Pro, its shell feels as sturdy as ever. You won’t hesitant to toss it inside a laptop bag, and you won’t have to worry about treating it with unusually delicate care. Physically speaking, the G305 is built into a gentle curvature that makes it optimally comfortable for a palm style grip. Those who use a claw grip will find the G305 equally adapted to their needs, thanks to all six buttons being accessible from either holding position. 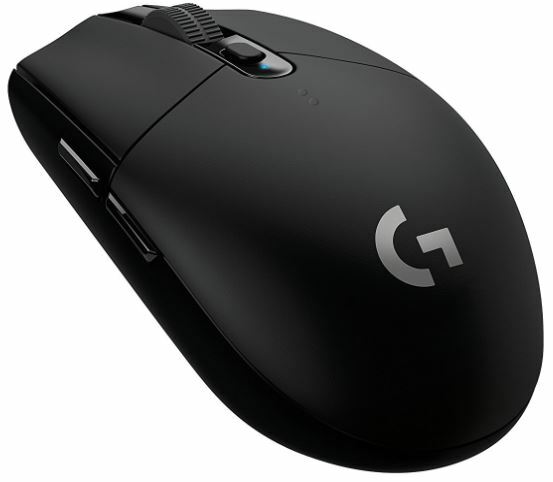 Additionally, the G305 is perfectly symmetrical, which makes it swappable for people who are left handed. Even if you’re not left-handed, the symmetrical design makes this mouse more functional when you’re grabbing at your mouse from an awkward angle. The two most prominent mouse buttons are the standard thumb buttons on the left side of the G305. Those thumb buttons aren’t swappable, which is another feature you’ll find locked away on the premium G903. 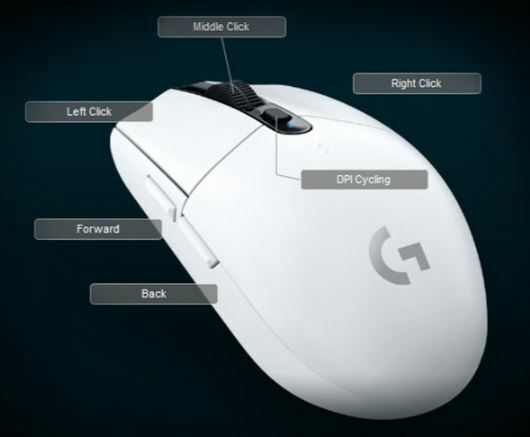 The remainder of the added buttons are positioned in relation to the mouse wheel. And the G305’s wheel has strengths of its own. The most obvious is its smooth scrolling, but what’s less obvious is that the wheel has been slightly widened. Widening the wheel has made for much easier contact, and a much more controlled scrolling experience. The last thing to notice about the design of the G305 is its removable top. The portion of the mouse where your palm would rest can be removed. Inside you’ll find storage space for the USB connection dongle, and the place to enter the necessary AA battery. As the name of this mouse suggest, Logitech is using their LIGHTSPEED wireless technology. Branding aside, that technology is what allows the G305 to maintain its ultra-low 1ms latency in spite of being wireless. As far as input lag is concerned, responsiveness at 1ms feels the same as using a wired mouse. That makes the G305 a great mouse for people who have traditionally held on to wireless mice for performance reasons. Unfortunately, running the mouse at such high latency is a power-intensive feature, but more on that later. 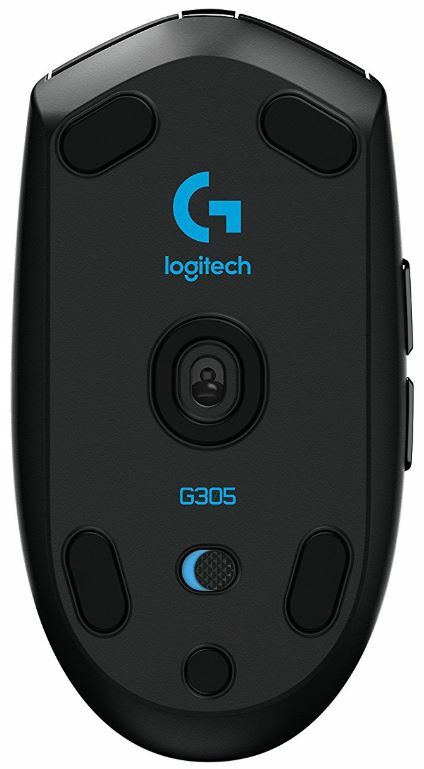 Inside the G305, you’ll find what Logitech calls High Efficient Rated Optical (HERO) sensor. You may recognize that as the same sensor that’s used amongst Logitech’s best mice. It supports a wide range of DPI settings, ranging from 100 to 10,000 DPI. No matter if you’re gaming or doing graphics design work, it provides a range which allows you to choose the perfect sensitivity for your needs. And you can toggle between those settings in a simple click, using the two sensitivity adjustment buttons adjacent to the mouse wheel. That makes it incredibly easy to swap between one task and another. And the deep customizability of these settings is easily one of the strongest features of the G305. The next hurdle a wireless mouse has to overcome is battery life. And Fortunately the G305 has much to offer within that category. 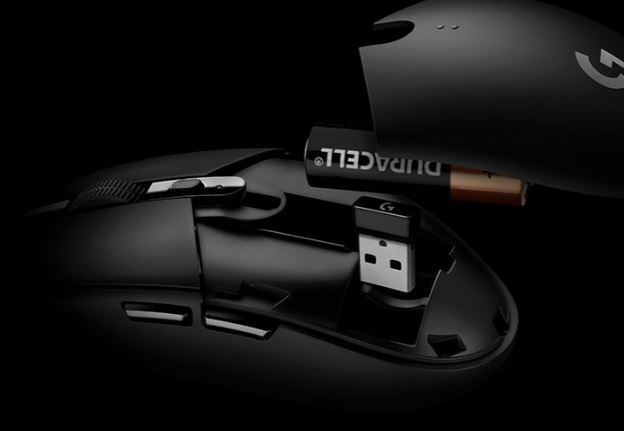 One AA battery can keep your mouse running for 250 hours while maintaining that impressive 1ms response time, or about ten days of continuous use. Other mice can offer more than 250 when they’re full of lag and delay. But here’s the kicker. Using Logitech’s software, you can toggle the G305 to endurance mode. That mode switches the G305 into running at 8ms response time. When switched to endurance mode, battery performance is closer to nine months. That means if you’re not gaming, you can switch the mouse over to start saving battery power. And as a result, this mouse is equally equipped for being used at home, or being taken on the road. You can just switch over to its gaming performance mode when the time comes! One of the things that separate Logitech from generic mice is their extensive software support. Logitech Gaming software offers a fair amount of customization options. You can raise or increase the number of DPI sensitivity levels you’re using. You can toggle the polling rate for your mouse. All six of the buttons can be remapped to new functions, and it’s all possible with easy to use drop-down menus. And then there are things which are somewhat less obvious. For example, you can create macro buttons, or make use of some of Logitech’s presets. For example, you can turn one of the thumb buttons to move forward or backwards in a browser’s history. Whether or not you had planned on using macro buttons, some of these presets can be surprisingly useful. And this software is where you establish your personalized DPI settings. There’s a maximum of five presets. But if you’re someone who only wants to use two settings, you can turn it down within the software. That deep level of customizability is something you generally don’t see from generic brands, and it’s not always something you see on mice within this price range. Even if you own an older Logitech mouse like the G500s, you may find your mouse gains features years after you bought it. That’s because Logitech’s gaming software is that it’s constantly being updated and improved. No small part of what makes the G305 so highly customizable is the fact it’s inherited years of software-side design improvements by Logitech. And you can rely on that software support to continue into the future, potentially adding new features to the G305 in years to come. When you’re struggling in a game, you don’t want it to be because your mouse is failing you. Little can be more frustrating than losing simply because your mouse isn’t any good. And the HERO sensor goes a long way towards giving you accuracy and responsiveness you generally won’t see on wireless mice in this price range. Consequently, the G305 has responsiveness that’s functionally equivalent to a wired mouse. For making snap shots on your enemies, this mouse performs essentially the same as any wired count-part you could think of. When you’re thinking about gaming, another concern is the acceleration of the mouse. If a mouse tends to respond poorly from starting and stopping positions, then you get a disjointed and potentially gaming-unfriendly experience. Fortunately, the G305 has butter smooth acceleration. You can suddenly stop the G305, and the feedback feels totally accurate. It even has a pleasant glide on hard surfaces. One feature you won’t find is support for Logitech’s PowerPlay mousepads, which offer wireless charging. But adding that feature would’ve spiked the price of this mouse, which is one of its biggest selling points. And the G305 uses an optical sensor, which means this mouse won’t work well on a glossy surface. If you’re using a reflective, glossy desk, then you’ll need to use a mousepad or something similar in order to make use of the HERO sensor. Who Should Choose the Logitech G305? When you’re using a PC, keyboards and mice are the peripherals we spend most time in contact with. It’s important they feel comfortable and natural to use. Everyone has their own preferences. Some people like heavier mice, some people like light mice, and some people are indifferent. The G305 design is distinctly light, which some people will like and others will not. From a feature perspective, just about the only thing the G305 doesn’t have is its own rechargeable battery. But that would’ve drastically increased the price of the G305. 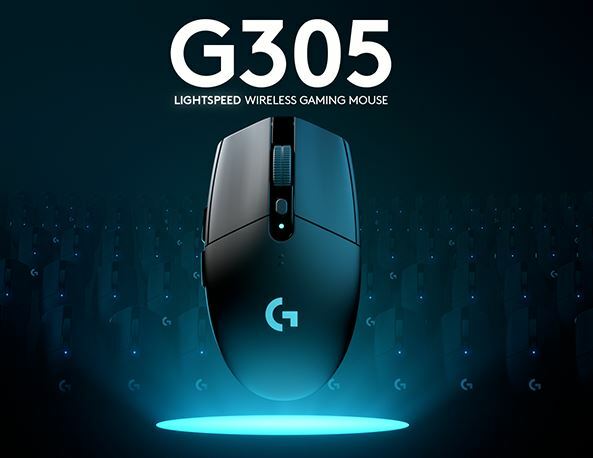 The G305 is an inexpensive alternative to someone who wants the convenience of wireless mice with the performance of their wired counterparts. It’s for someone who takes gaming seriously, but doesn’t want to shell out $100 for a mouse. Aesthetically, the Logitech G305 isn’t the flashiest mouse on the market. It’s not lacquered in RGB LEDs. What you’re paying for is performance. You’re getting response times, connectivity, and accuracy. The ambidextrous design only adds to its versatility. The G305 uses top shelf hardware, and you’re getting exactly what you see. And with its endurance mode, it’s easy to recommend the G305 to almost anyone. For people who want wireless mice but aren’t willing to pay for the top-shelf G903, the G305 is an incredibly strong value.